There is a story emerging in our world that is not being told by our media. It is the story of the relocalization process that is being precipitated both by necessity and by possibility. This transition represents the end of an era of economic and population growth stimulated by an abundant supply of cheap fossil fuels. It also represents the beginning of a change towards a more balanced and thoughtful approach to the business of life, and the life of business. Together we face a convergence of interrelated global challenges that are forcing us to find better ways of doing things and making our communities work. We are changing our attitudes toward - and relationship with - energy, climate, food, economics, health, waste, and the environment. At the same time, we are establishing new norms for how we communicate, work, live our lives, and ensure that the goods and services we need are sustainably produced and available from reliable local sources where possible. Next Okanagan covers the story the extraordinary challenges and opportunities that we face, and the story of the emergence of a new culture of local resilience. It provides perspective on the primary challenges, and spotlights inspiring and visionary signs of people rising to the occasion - whether as individuals, neighborhoods, communities, institutions, companies or organizations. It gives coverage to issues of relocalization, food quality and security, healthy and sustainable business practices, and social responsibility and social justice, and efforts to deal locally with the challenges and opportunities of change, developing food, energy and economic alternatives, and building community. No place has as much potential for developing a self-reliant economy than the Okanagan, and it is ideally located to create a cultural identity that is true to place. 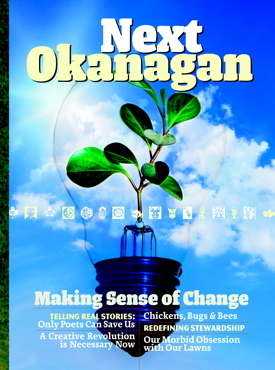 Next Okanagan is for people who want to be told different stories than the ones they hear every day. It brings these stories in the form of long-form in-depth analysis as well of short bursts of practical information readers can act on. Next Okanagan is a collaboration between the Okanagan Network for the Environment and the Okanagan Institute, both organizations that have deep roots in the region. Between them they reach a broad swath of the population through their connections to environmental, arts and culture, and social justice groups. Their combined reach of thousands of individuals and dozens of related groups makes their association, and Next Okanagan, one of the most potent local forces promoting positive change through resilience, common sense, regeneration and creativity. If you want to be a distributor of Next Okanagan at your location, please Contact Us. The Okanagan Media Alliance is dedicated to bringing together those working to create a resilient society. We also produce guides to the good things in life: organic agriculture, sustainability, conscious consumerism, fair commerce, the creative arts - anything that helps you live a good life that also happens to be good for others, and good for our planet. A recession is when your neighbour has to tighten his belt. A depression is when you have to tighten your own belt. And a panic is when you have no belt to tighten and your pants fall down. The artist picks up the message of cultural and technical challenge decades before its transforming impact occurs. He then builds models for noah's arks for facing the change that is ahead. For editorial and advertising information click here. | To contact us click here.